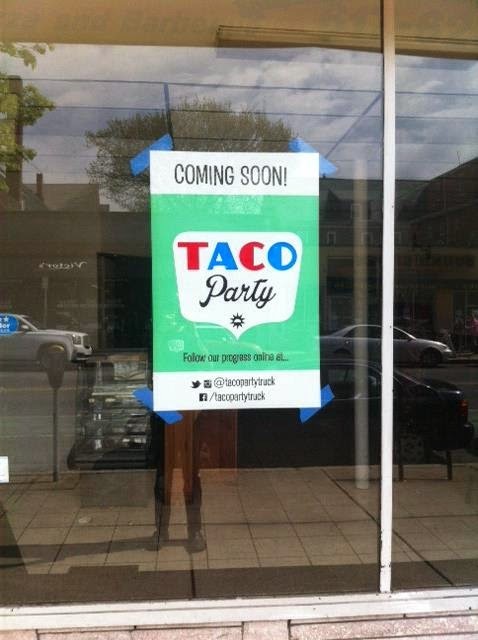 Taco Party coming soon to Somerville. Taco Party, the all vegetarian / vegan Mexican-inspired food truck slinging Chimichurri Tempeh Tacos, Tofu Tacos and Chorizo Seitan Tacos, is getting a brick and mortar store of its very own according to a recent Facebook announcement. "Checks have been written, keys handed over. I can now officially announce Taco Party the restaurant! We've always had such great experiences in Somerville so we've chosen Ball Sq as our new home. 711 Broadway is the spot. I won't be so bold as to choose the opening date yet but we will act fast! Can't wait to put a roof over your heads!" Taco Party hit the streets in 2013 with Keith Schubert (ex-The Raging Teens) behind the wheel. The truck can be found in the Boston area Tuesdays, Wednesdays and Thursdays and is also available for catering. Follow Taco Party on Facebook and Twitter for updates and truck schedules. And visit www.tacopartytruck.com for complete information.